Instant-access schedule & play capability eliminates need to queue files in advance. Instantly start or schedule-insert any video file from the library that can include 1000's of video clips and programs. Serves PEG stations, cable-access, high school, & other educational access channels that seek ease of use, flexibility & low cost. For terrestrial television stations that want an all-in-one server to schedule & play commercials & programs, control switchers and even record & segment live & satellite shows. 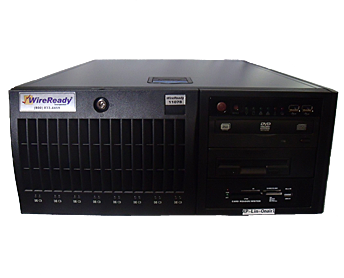 All-in-One Playout and Scheduling solution that supports an open file container/format with a wide range of manufacturer video capture/playback cards. Take video news clips STRAIGHT to AIR. File-based playout designed for newscasts & talk shows. Playlisting lets you stack files and import rundowns from 3rd party news systems. Tweeting news updates, software improvements, links and more. Copyright © 1989-2011 WireReady® Inc.